NEW ORLEANS – There were several performances this past weekend that altered the NCAA Division III Women’s Outdoor Track & Field National Team Rankings. 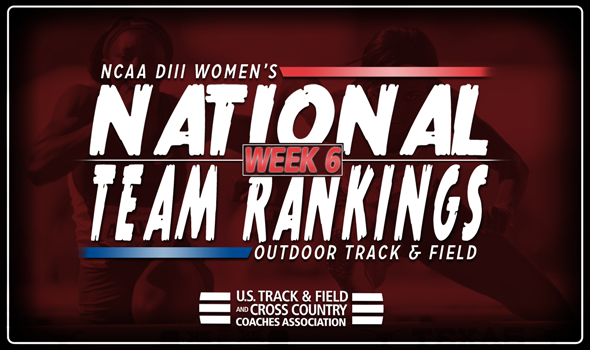 Only three of the top-25 teams in the most recent rankings released Tuesday by the U.S. Track & Field and Cross Country Coaches Association (USTFCCCA) remained in place from the previous iteration: No. 1 Claremont-Mudd-Scripps, No. 5 Emory and No. 23 Illinois Wesleyan. UW-Eau Claire jumped from No. 8 to No. 2 this week after gaining 52.79 points between Week 5 and Week 6. The Blugolds leapfrogged five other teams to settle right behind the top-ranked Athenas. UW-Eau Claire received standout efforts from two throwers this past weekend, among others: Erica Oawster and JoHannah Theisen. Oawster is now ranked second nationally in both the shot put and discus, while Theisen is ranked third in the shot put. UMass Boston crept closer to the top following Wadeline Jonathas’ record-breaking run. Jonathas lowered her own NCAA Division III record in the 100 from 11.50 to 11.40. That now gives Jonathas top national marks in the 100, 200, 400 and she’s No. 2 in the long jump. Washington (Mo.) comes in right outside the top-5 at No. 6. The Bears saw Annalise Wagner notch the second fastest time in the nation in the 800 this past weekend (2:07.31). Other notable changes in the top-10 included Whitworth moving up two spots from No. 9 to No. 7, Ohio Northern going from No. 10 to No. 8 and Carthage gracing the top-10 at No. 9 for the first time in program history. The Lady Reds previously had an all-time best rank of No. 11, which they achieved last year and in 2011. Augustana (Ill.) and UW-Stout were new additions to the top-25 at No. 20 and No. 24, respectively. The final day for athletes in NCAA Division III to qualify for the national meet is May 17, so we could see some big changes coming soon. Remember: The 2018 NCAA Division III Outdoor Track & Field Championships will be held May 24-26 in La Crosse, Wisconsin.